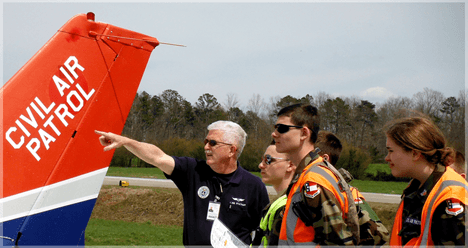 The Civil Air Patrol (CAP), is a national organization that is over 70 years old, little publicized, and made up of an all-volunteer force of about 64,000 nation-wide first responders. The CAP was created by Congressional authorization, first as an auxiliary to the U. S. Army Air Corps, before the Air Corps became the U.S. Air Force (USAF). It operates in all 50 states, with the national headquarters at Maxwell Air Force Base in Alabama. The CAP flies more than 90% per cent of FEMA’s aerial photography and mapping missions, responding to national disasters such as for hurricanes Katrina and Sandy, most earthquakes, and the Twin Towers terror attack on 9/11/01. The CAP also flies more than 95% of all continental U.S. search and rescue missions as directed by the Air Force Rescue Operation Center. At The Ready Magazine caught up with the Georgia Wing of the Civil Air Patrol on exercise in Ellijay, Georgia. In the Georgia Wing, CAP is headquartered at Dobbins AFB, and the local unit, the 507th squadron, is out of Ellijay, GA. They meet weekly, and hold exercises regularly for both the adult volunteers and the teen Cadet Program. For this exercise, CAP pilots flew their CAP aircraft to the Gilmore County Airport from Dahlonega, Athens, and Lawrenceville to participate in the exercise. The weekend’s SAR exercise had the squadron detecting the signal from a simulated plane “black box” recorder to locate a simulated civil aircraft crash scene. Special thanks to Squadron Commander Capt. Burrell for allowing us to spend the day with the GA-507th Ellijay Composite Squadron. Information for this article was provided by Chaplain (Capt.) 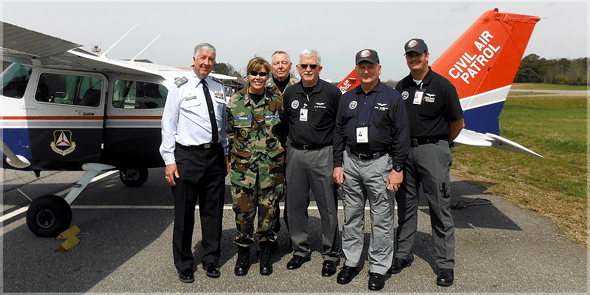 James Bradley, 1LT Donald Murray (Public Affairs Officer), LT. Jennifer Williams, Lt. Carola McSwain, and Maj. Fred Koenig, GA Wing Emergency Services Director. The CAP was formed for three distinct purposes, including aerospace education and the popular air cadet program, but its purpose first and foremost is to provide emergency services. A combination of experienced, well trained CAP pilots and ground teams work together in search and rescue missions in difficult terrain, coordinating from the air to get ground teams to victims to render assistance. The CAP is dispatched and responds to civil aviation accidents, hikers lost in the woods, and other life-threatening situations. Their incident command expertise helps to coordinate and direct limited resources to help ensure the victims of disaster get the help they need as quickly as possible. six days ahead of Pearl Harbor, the all-volunteer CAP logged in excess of 500,000 hours of service during WWII. Flying open cockpit J-3 Cubs during the war, the CAP is credited with sinking two submarines (dropping bombs by hand!) and saving countless lives of sailors who were stranded in the water. Today the CAP fleet consists of over 500 small aircraft, acquired by the Air Force and painted the CAP colors of red, white, and blue, and marked with the CAP logo. The aircraft are distributed amongst the state wings, each of which is further task organized into squadrons. The CAP pilots maintain all FAA pilot requirements, but have the added responsibility of being CAP certified, and must renew this certification every year. The CAP pilots fly according to strict Air Force requirements. Pilots respond by flying to the call, then flying their grid search missions for roughly two hours, returning to the incident command area location to refuel, make their report, get re-briefed, and re-hydrate. Authorized fuel for missions and training is reimbursed; these patriots pay out of pocket. CAP ground teams also respond to the incident area, and are coordinated with the spotters in the air to get to the victims of an emergency. These expert SAR teams learn survival skills as well as EMS, and they cover rough, mountainous terrain, often in the snow. Many victims who survive a civil air accident (and only about 20% do) could succumb to exposure as the CAP works to find and get lifesaving treatment to them. These ground teams reach people in places that many vehicles cannot, and that rural first responder resources are too limited to cover in a timely manner. The Cadet Program trains the next generation of volunteers. Kids as young as twelve can be accepted into the cadet program. They receive training in aviation and safety, SAR, leadership and military service. Volunteers and Cadets are never required to join the military, but completion of the cadet program benefits those who enlist by earning them the rank of Airman First Class (E-3); 8% of all Air Force Academy cadets come from the CAP cadet corps. The Air Force academy selections from the CAP must meet academic and other requirements, but do not require the congressional appointment of non-CAP admissions to the Academy.